Here a flock of Mouflon are in the snow nibbling on pieces of bread. A male and female can be seen standing side by side waiting for some more bread. Photo by Alexis Tucker. GRAFENWOEHR, Germany — Would you like to make her swoon with a non-generic Valentine’s Day date? Maybe you’re just an outdoorsy couple, animal lovers, or you want to take your children somewhere unique. If you nodded yes, you should explore the Wildgehege Hufeisen in the Veldensteiner Forest, a nature reserve about 30 minutes west of Grafenwoehr. Along the barrier free path, with a little patience and a good eye, you can spy a spotted deer or two frolicking in the snow near their mothers. For an ever further magical experience you can perhaps convince one to come nearer for a few treats. If you observe the Mouflon — a type of wild sheep — hold up a piece of bread and they will hop on over to you. The babies are the friendliest bunch and are very curious little fellows with wide eyes and snow covered snouts. The males hang out with their long horns in the background while the females and babies grab a nibble or two. Not only can you find a variety of animals in the forest, but you can also find a playground that includes rock climbing and balancing poles. Located around the playground are picnic areas which have covered tables and benches. 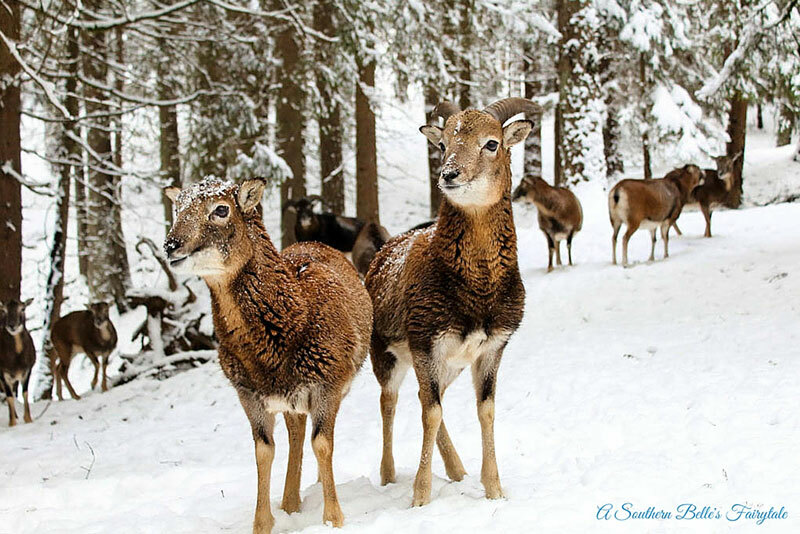 In the silence of the winter with the snow dwindling down, you can enjoy a picnic with your darling or your family while observing a herd of deer dashing by in the snow. If you have the time after a magical day spent in the park, the nearby restaurant, Waldschänke, which is within walking distance, offers hearty snacks with a cozy atmosphere, but don’t forget to grab a post card or two before heading out for only 50 cent euro. Each post card features a different animal. You can also purchase pamphlets with maps inside. According to the pamphlet I purchased, the first animals in the enclosure were 14 deer, who were lured with apple pomace from the surrounding forest into the fencing. Over time, fallow deer, wild boar, Mouflon and wild sika came and settled in the enclosure. This stroller-friendly park provides free parking. No dogs please. bring euro coins because you can use them to purchase food for the animals. Entry fee is €2 for adults and free for kids under age 18. March – October, 8 a.m. – 6 p.m.
November – February 9 a.m. – 4 p.m.